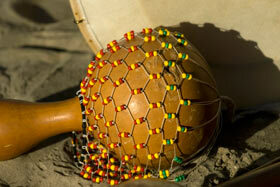 Learning Rhythm and music with the TaKeTiNa process always means learning about life too. Our inner obstacles can be transformed by the rhythmic evolution that unfolds in TaKeTiNa. Realms in our lives, previously separated, begin to integrate. Emotion with rational thought, intuitive feeling with cognitive action, passivity with activity, outer movements with inner silence - all meet in the simultaneity of rhythm. The mind becomes quiet, and an encounter with the inner self becomes possible. In TaKeTiNa, the participant remains part of a collective, and at the same time is able to learn at his or her own pace. New research from Europe is providing exciting results that demonstrate the benefits of participating in Taketina. See the Downloadable Brochure on the Taketina Institute website homepage for information and results. Some of these results are showing that even an hour or so of Taketina can have a similar effect on heart rate variability as deep meditation and restorative sleep. These healing states are almost impossible to achieve using medications.